Bernie Mayer is a professor at the Werner Institute, Creighton University, and a founding partner of CDR Associates. He has been working in the conflict field since the late 1970s as a mediator, facilitator, trainer, researcher, program administrator, and consultant. 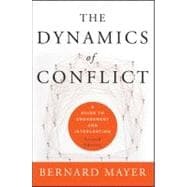 He is the author of Staying with Conflict, which won the 2009 outstanding book awarded from the CPR International Institute for Conflict Prevention and Resolution, and Beyond Neutrality, the winner of CPR's 2004 book award.